Our PW Pneumatic Wheels are air filled rubber wheels that are available in three standard sizes either with or without bearings. This popular range of pneumatic wheels can also have reducing bushes fitted to suit your axle or fixing bolt diameter. Reducing bushes can be found in our accessories page, or alternatively will appear as an optional extra once you have added these wheels to your basket. Puncture Proof Pneumatic Wheelbarrow Wheels are ideal if you are looking for a wheel that can not puncture! With a honeycomb core these rubber wheels behave like a standard pneumatic wheel, but will not deflate or puncture. For more information please click the product code. Metal Centred Puncture Proof Wheelbarrow wheels will not deflate or puncture! Surrounding the durable metal centre the polycellular honeycomb rubber acts like a pneumatic wheel, however it behaves like flat free wheel, as there is no inner tube to deflate. For more information please click the product code. Click on the button below to get expert measurement advice on choosing the right wheelbarrow or pneumatic wheels for your situation! 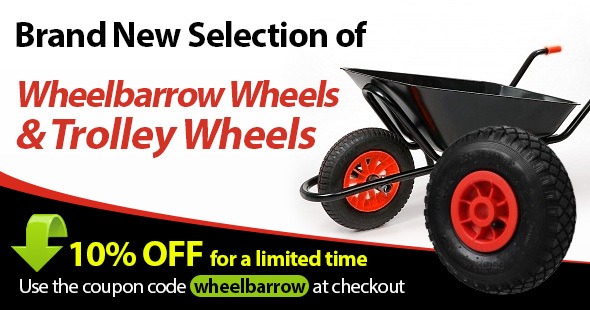 Our range of wheelbarrow and pneumatic wheels can be viewed below. Alternatively, call the team on 0116 276 4987 or email sales@rosscastors.co.uk for quick, expert advice!